Enter your myNOVA or Blackboard Account username and password in the pop-up box. Successful print submission will be confirmed by a pop-up. Click X to close the pop-up. 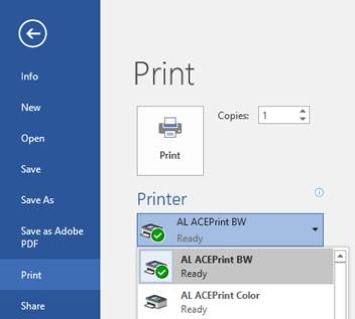 Go to the nearest ACEPrint device to release your print job. If a print job exceeds 20 pages, a pop-up will appear. To continue, click "Yes" or click "No" to cancel the job. If your document is submitted on a non-standard size, a pop-up message will appear. A non-standard size is something other than 8.5 x 11 (letter) or 8.5 x 14 (legal). Select "Yes" to proceed, select "No" to cancel.